In this Tuesday, Jan. 20, 2015, file photo, then-state Sen. Thomas Garrett, R-Buckingham, speaks during a debate on a bill during the Senate session at the Capitol in Richmond, Va. Republican Rep. Thomas Garrett will no longer seek re-election, saying he needs to work on recovering from alcoholism and renewing his commitment to his family. 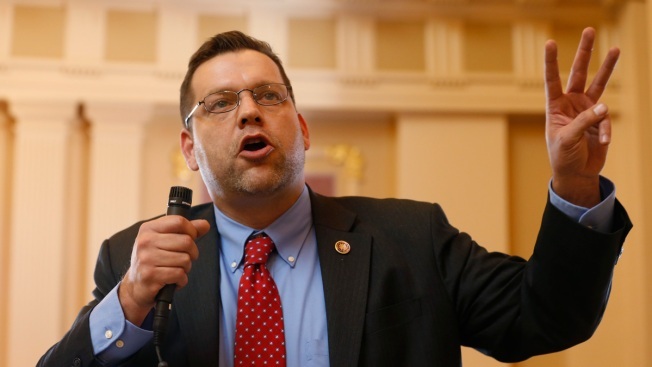 Republican Congressman Thomas Garrett of Virginia announced Monday that he will no longer seek re-election, saying he needs to work on recovering from alcoholism and renewing his commitment to his family. "Any person — Republican, Democrat or Independent — who's known me for any period of time and has any integrity, knows two things: I am a good man and I am an alcoholic," Garrett said. "This is the hardest statement that I have ever publicly made, by far." Garrett's tepid fundraising had worried members of his party, but he said his decision not to seek another term was not motivated by fear of losing his seat. Garrett said "sometimes winning means knowing where your priorities should be." "This isn't an ending for me, or my values of service to my fellow man, it's just a new beginning," Garrett said. Garrett represents Virginia's reliably Republican 5th district, which runs from Northern Virginia to the North Carolina line.